Many of the ornamental grasses are in flower right now, and one that makes a stunning display all summer around the County is Calamagrostis x acutiflora, commonly called Feather Reed Grass. Calamasgrostis is a member of the Poaceae family, which also contains most of the common turfgrasses like Fescue and Bluegrass. 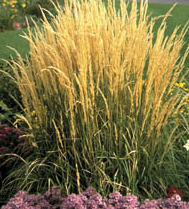 Calamagrostis, however, is a dramatic ornamental grass that you can use in mass plantings or as an accent in a perennial bed. By far the most common and popular cultivar is 'Karl Foerster, which was introduced to the trade by the german horticulturalist Karl Foersterin 1950, claiming that the original source plant was from the Hamburg Botanical Garden. This cultivar was named plant of the year in 2001 by the Perennial Plant Association, which proclaimed it "one of the most versatile, attractive, and low maintenance ornamental grasses." The stiff arching stems of deep, shiny green foliage appear in early spring, followed in May or June by gorgeous pink or plum-colored flowers. As the seed heads mature, they become deep tan through rusty-brown, and very narrow and upright. Its growth habit is vertical, with foliage generally to 3-4 feet, flower stems to 5 feet, and 2-3 feet wide. Its ultimate size is dependent on the amount of water it receives and how long you grow it before dividing it. Karl Foerster takes full sun to part shade, and moderate water--generally a couple times a week, as it likes moist soil. It will tolerate a wide range of soils - including clay - but does best in well-drained fertile soil. Size will depend on soil fertility, as well as water, so if larger plants are desired, make sure to amend the soil with compost before planting and give it enough water. In hotter situations, and with less than optimum moisture, summer heat may cause feather reed grass to enter summer dormancy. This grass is subject to few problems, and requires little maintenance other than as discussed above). It is a deciduous grass, and should be cut back to about 6" in late winter or very early spring. Karl Foerster can be propogated easily by division, usually in spring or fall. Its seeds are sterile which means this grass will not self-seed and become an invasive problem. It also means that you cannot propagate it from seed. Calamagrostis sways gracefully in the faintest breeze. A row at the edge of a pool, or a mass planting next to a path or stone patio will move gloriously in the wind. Specimens of Karl Foerster stands out against lower perennials like Achillea or Nepeta and late summer and fall-blooming perennials such as Gaura, Caryopteris, Rudbeckia or Perovskia. It also combines well with other contrasting ornamental grasses, such as Pennisetum oriental, Helictotrichon sempervirens and Festuca Californica. Two variegated cultivars are 'Avalanche' and 'Overdam'. Overdam is somewhat more compact than Karl Foerster, and is shade tolerant--especially in warmer spots. Its foliage is white and green striped, and it sports silky, reddish-pink flower plumes in July and August. It will also tolerate clay soil. Avalanche is similar to Overdam, also more compact, but with a bit more green to the foliage--it's variegation is a white stripe down the center of green leaves--the opposite of Overdam. Its flower plumes appear in June typically. It also tolerates full sun to part shade, wants moderate watering, and manages a range of soils, including clay. If you'd like to see Calamagrostis used in mass plantings as well as inter-planted with shrubs and perennials, visit Matanzas Creek Winery on Bennett Valley Road in Santa Rosa. In September the straw-colored seed heads wave above the foliage and catch the softening light. If you go next June to see the Lavender bloom, don't forget to look for the Calamagrostis! The flowers are in early summer are a soft, plum color, and work beautifully with the Lavender's more dramatic display.